Remember when Bush Sr. promised, "Read my lips. No new taxes," and how that turned out? It's typical of the political classes. As a general rule, whenever a politician makes a solemn promise, reverse the meaning of that promise to obtain the real meaning. Consider the claim by Hamilton's politicians, in response to Uber's massive campaign of non-compliance with Hamilton's taxi bylaws, that they would "level the playing field." As it turns out, they did the exact opposite. Instead of levelling the playing field, they created a whole new section of the bylaw, with the specific intention of exempting the Uber taxi brokerage from the laws other brokerages are required to comply with. Hmmm. That is a perfect description of a taxi brokerage. 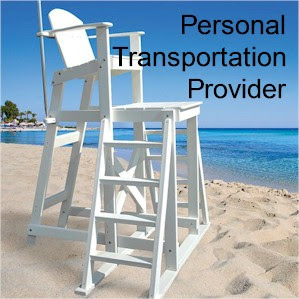 "“personal transportation provider driver” means any person affiliated with a PTP who transports passengers for compensation using a PTP platform and may also be referred to as a “PTP driver”"
I.E. - a taxi driver. 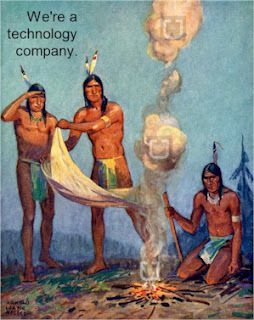 "any platform to connect passengers with PTP (taxi) driver," could mean using a telephone to summon a cab, or an app, or a web-page, or a guy standing on a lifeguard stand employing smoke signals. At this point it ought to become clear to the reader that the new "licensing category" is nothing but the formalized exemption of the Uber taxi operation from most of the bylaws that the other taxi companies must comply with. Now that the fraud of the city's kow-towing to the Uber cab company has been exposed, let's turn our attention to the question of what a truly "level playing field" would look like. There two, and only two, possible scenarios for the achievement of a level playing field for taxis in Hamilton. "They are welcome to come to the city of Hamilton but they have to fall within the current bylaws that are written. That means they must become a broker, they must use licensed taxis and licensed drivers. The reason the bylaws are in place is to ensure customer safety, and consumer protection. 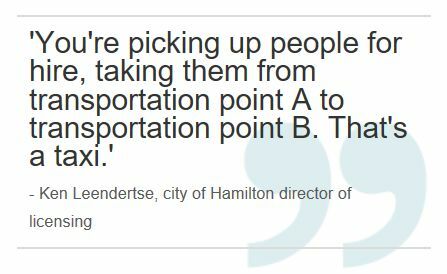 Those are the two issues we’re worried about, and if they follow those rules, Uber, they’re welcome to come to Hamilton.” explains Ken Leendertse, Director of Licensing." It was not long however, before the City of Hamilton found itself to be not in compliance with Uber's business model and hence came the scramble by city officials to rectify their taxi bylaw in order to guarantee profits for Uber, its investors, and its banking partners in the Netherlands. 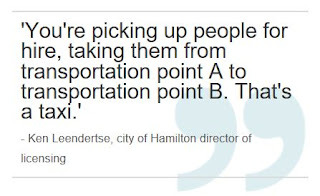 Mr. Leendertse was quoted elsewhere as stating, "The city's director of licensing says it's up to politicians to decide whether Uber can overcome regulatory hurdles to operate in Hamilton." When I read that I knew the fix was in. It was obvious that Uber would not be able to compete on a level playing field with other taxi operators. The only way Uber could become a successful taxi operation in Hamilton would be if it were given a pass on the "regulatory hurdles" applicable to its competitors. And that is exactly what the City of Hamilton ended up giving them. The second "level playing field" scenario would have been total deregulation of the Hamilton taxi industry. Anyone with a driver's license and a car would be elligible to enter the taxi trade. Prices would be set by the market and the supply of taxis would only be limited by the number of third world immigrants willing to work for less than the minimum wage. This second scenario is the one preferred by the libertarians, who naively supported the Uber corporation, believing it to be the harbinger of the free market revolution they have been praying for, for so long. The problem with the second scenario is that it would not comply with Uber's business model either. Uber can only prevail so long as its competition continues to be hamstrung by "regulatory hurdles." I have come to know many of the immigrants who make a living in the Hamilton taxi business over the years. They never cease to amaze me with their ability, not only to survive under Hamilton's insane and, often spiteful, taxi regulations, but to prosper. If they were given the opportunity to compete with Uber, head to head, on a truly "level playing field" they would eat Uber for lunch.